"Would love to do it again. We learned so much!!! I can't say enough good stuff." 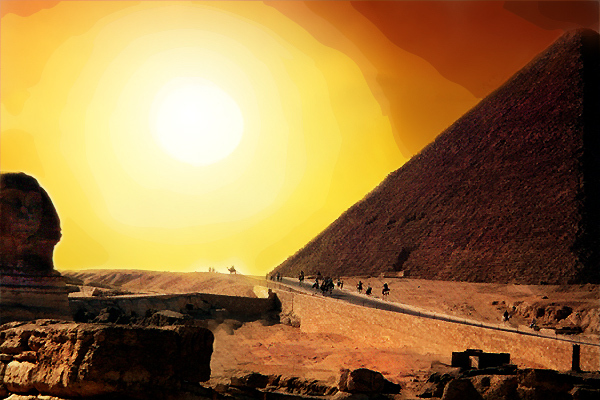 Experience the best of Egypt in the shortest time. Your blink into the past will be forever highlighted by experiencing both Upper and Lower Egypt. A short flight to Luxor, and crossing the Nile, brings you to ancient Thebes, burial ground of the great Pharaohs. The nearby Valley of The Kings with Tutankhamen's Tomb, reveal an extraordinary underground complex and breathtaking paintings. At CAIRO INTERNATIONAL AIRPORT, you will be met by the 'TRAVEL HOUSE OF EGYPT' representative and transferred to the CAIRO SONESTA TOWER HOTEL (or similar Superior Comfort Level Hotel) for the remainder of your stay in Egypt. Following an early morning flight to LUXOR, begin with crossing the NILE to the West Bank and continue with a lively visit to the NECROPOLIS of THEBES, burial ground of the great Pharaohs, and also the COLOSSI of MEMNON. Today's highlight is visiting the fabulous VALLEY OF THE KINGS, where, so far, sixty-four Pharaonic tombs have been discovered, including TUTANKHAMEN'S TOMB. Winding through tunnels and corridors, you discover the TOMB OF SETI-I, an extraordinary underground complex with breathtaking paintings. After lunch, you first return to the East Bank of the Nile, seeing two of Egypt's finest temples, LUXOR and KARNAK. The 4000-year-old Karnak was the seat of Amon-Re, the Imperial God. It may just take your breath away as you survey the temple structure which focuses on the awesome HYPOSTYLE HALL. LUXOR, sacred to Amon, is beautiful with its impressive statues of Ramses II. There you will marvel at the inner sanctuary rebuilt by Alexander the Great . . . better yet, recognize familiar signs and symbols of temple worship which reveal the eternal nature of covenant making. An evening flight returns you to Cairo. Experiencing CAIRO includes hearing about Islamic religion in the ancient mosques, and sensing the bustle of nearly 14-million people. Visiting the CITADEL, the MOSQUE and the BAZAAR is experiencing an enthralling mix of old and new. In the Bazaar you can begin practicing the ancient art of bargaining. In the afternoon, enjoy the treasures of the EGYPTIAN MUSEUM and the fabulous KING TUT TOMB EXHIBITION. Upon departing this morning, follow the ancient Israelites' route into the Holy Land through today's Kingdom of Jordan into Israel. Crossing over the Sinai via modern jet plane is reminiscent of the forty-year trek the Israelites took although they did not have the comfort or speed of air travel. After passport control in Amman you will claim your luggage. Upon exiting luggage claim & customs a PLAZA TOURS representative will meet you and assist you onto your transfer to the Jordan River crossing into the Promised Land for your ISRAEL REVEALED Program. The wonder of two of Egypt's finest temples, Luxor and Karnak may just take your breath away as you recognize familiar signs and symbols of temple worship. An evening flight returns you to Cairo. Experiencing Cairo includes highlights of the Islamic religion in the ancient mosques. The bustle of nearly 14-million people is an enthralling mix of old and new. In the Bazaar you can practice the ancient art of bargaining. Enjoy the treasures of the Egyptian Museum and the fabulous King Tut Tomb Exhibition, some of the oldest pyramids, including Cheops, one of the seven wonders of the world. Coming face-to-face with the Sphinx, who has been staring into the desert for five-thousand years, is like stepping into a time-travel machine.